Chiastolite is a variety of the mineral andalusite with the chemical composition Al2SiO5. It is a form of the mineral andalusite containing carbonaceous inclusions giving a cross-shaped appearance. It is a rock-forming mineral that is mined for use in high-temperature refractories. It is is a brown variety of andalusite which contains a black cross. 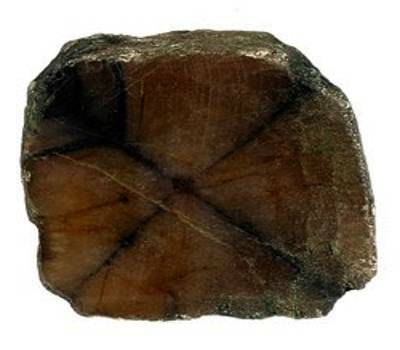 The name chiastolite derives from the Greek Christos meaning “cross marked”. This crystal also holds a common name of Cross Stone. Color: Light brown with a black cruciform shape. 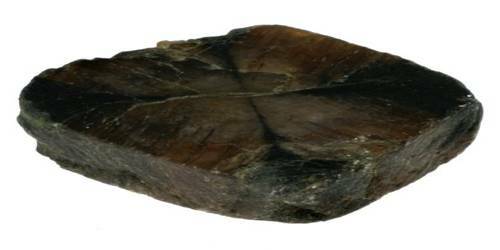 This unusual stone is regarded since a long time as a highly protective stone, and these ancient beliefs have somewhere proven themselves correct due to the physic abilities that this stone possesses. These crystals are often sectioned, polished and used as amulets, sometimes chiastolite is cut into cabochons. It is noted for distinctive cross-shaped black inclusions of graphite. In areas around Georgetown, California, metamorphosed sediments contained andalusite and chiastolite in a graphite-rich metasediment. The chiastolite crystals have been pseudomorphically altered by a mixture of muscovite, paragonite, and margarite. The calcium-rich margarite tends to form along the graphite-rich crosses or bands within the chiastolite. Mineralogically the occurrence is important because all three white mica phases are present in an equilibrium assemblage. It can be associated with cordierite in hornfels, granite, and granitic pegmatite.